I saw this picture and I just had to take a crack at it. It’s from a photo taken by mustcreate at wet canvas. My camera just didn’t do this painting justice. I tried to paint this with a vibrant and translucent feel and I accomplished that with some moderate success, but this was the best photo that I could get from my camera. Unfortunately, the camera didn’t hide the fact that I still need to work on my shadows, and I should have sharpened my pencil for the outside of the marbles. This is a great color practice. I just drew the marbles with a circle template and went to town. I have another piece that I have ready to get started on and I’m really excited. It’s going to be in graphite which is a little more in my comfort zone, because I have been drawing in graphite for quite a while. I have this little theory that if I learn to draw and shade the rest is only color theory, support and technique. We’ll see. I am very lucky to have this opportunity to be able to draw to my hearts content, but I don’t believe I am taking the full advantage of my time. As much as I detest lists and structure I feel like I need it. I’m not saying that I will, I guess I’m saying I should. I don’t think it would take away from the pleasure that I get out of drawing, but there is alot of things that I want to learn. I would love to draw life studies (nudes) whenever I get over the fact that they are naked, portraits, pets of course, still life and landscapes . Basically If I see it, I want to be able draw or paint it. If I want to be able to accomplish all of these things then I need some sort of game plan. I think I could do it. Parents homeschool their children, why can’t I give myself a little (in)formal art instruction? I love this sketch! I like the depth of the marbles and the fluidity of the shadows. 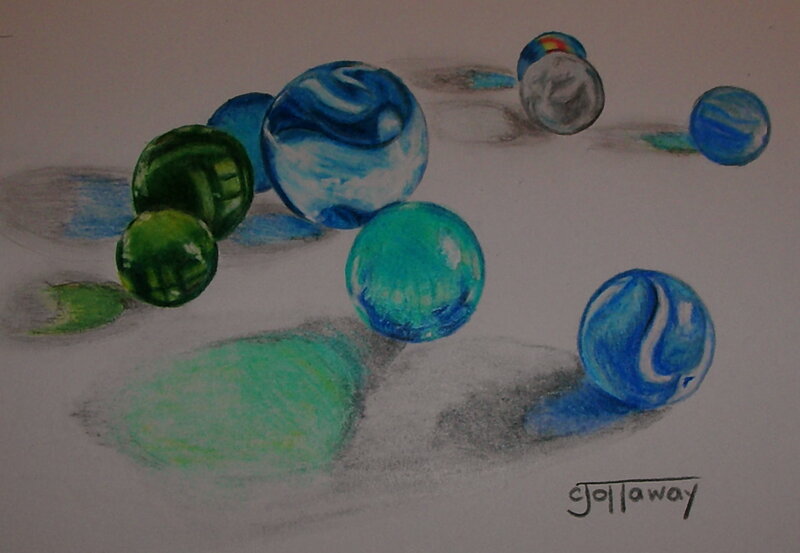 My nephew loves marbles, and I thought of trying to draw him a picture of one. Your sketch gives me an idea of how to go about it. I will have to get some Bristol smooth paper, though, as my sketchbook has too much “tooth” in it. I just want to emphasize how nice these marbles look! 🙂 THanks so much for commenting on my post, and the couple do love it and I am just so excited about it. I am sure you’ll be able to draw people, you just need to try it, it’s really fun! Hi Carol. Thank you for your comment on my little apple drawing. I would love to be able to use the reference you have for the marbles, if you don’t mind my sharing it. My email is coeta88@comcast.net. I couldn’t find yours to email you directly.